Our JT Direct Inkjet Plate enables for a low-cost, simple plate production solution that provides pleasing color every time. Offering run lengths up to 20,000 impressions, the JT aluminum plate is designed to be imaged on a standard Epson inkjet printer using standard inks. Presstek's JT Direct Inkjet plates provide the lowest cost of ownership compared to any existing CTP system in its class. 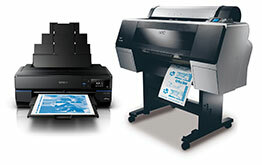 The cost is simply that of an Epson Stylus Pro high quality inkjet printer using standard UltraChrome K3/HDR inks combined with a RIP. One compact, versatile system enables you to produce your aluminum offset plates as well as your proofs, posters, stickers or any other inkjet output your shop needs to produce.